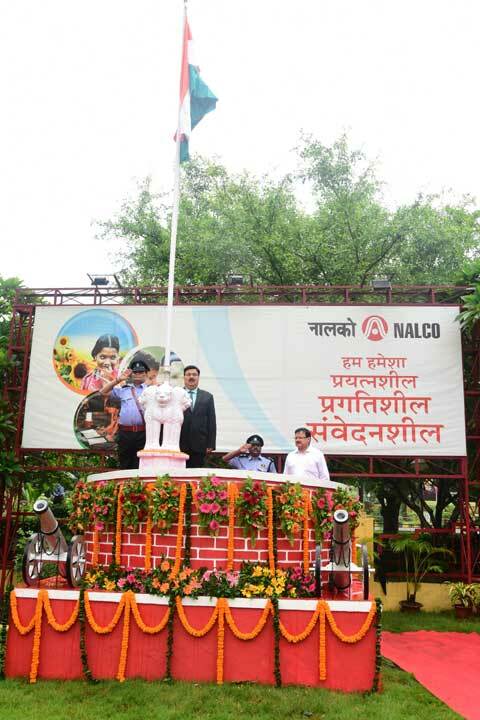 Bhubaneswar: The 72nd Independence Day was celebrated at NALCO’s Corporate Office at Bhubaneswar on 15th August, with patriotic fervour. Dr. Tapan Kumar Chand, CMD, hoisted the Tri-colour and addressed the employees on the occasion. “A confident NALCO is continuously growing in the backdrop of achieving raw material security, new milestones in R&D, redefined corporate plan and business strategy and time bound action plan. We have started implementing an expansion plan to achieve 1.1 million tonne Aluminium production by 2022-23 and 1.7 million tonne by 2027-28. New Alumina Refinery work in Damanjodi has already started, DPR for New Smelter and Power Plant at Angul are under preparation, a cluster of industries at Kamakkshya Nagar is getting developed for which land has already been identified. Recently, foundation stone for New Wire Rod Mill has already been laid and the project will be completed by mid-2020. Angul Aluminium Park is receiving huge response from project proponents and the demand of Aluminium from the proposed downstream units in the park is propelling the new Smelter to come first. A much rewarding Business Cycle of Demand-Production-Marketing-End Use products have been setting in making new smelters of NALCO commercially profitable. Angul Aluminium Park and new Cashless Model for MSMEs will create the necessary employment eco-system in Odisha,” said Dr. Chand. “With all these goals in pipeline, NALCO is all set to achieve higher goals and take Indian Aluminium Industry to gain global benchmark,” he added. It may be mentioned that NALCO has already created global benchmark by becoming the lowest cost producer of Alumina and second lowest cost producer of Bauxite in the world for. A mesmerizing Paika Dance performance by Kalinga Creations, Khordha, marked the occasion. It may be mentioned that NALCO is committed to making all efforts for scaling up this martial art of Odisha up to the international level.